Yoga is a spiritual, mental and physical practice that’s been around for centuries and is extremely beneficial for your mental and physical health. It’s proven to provide you with more energy, better posture, flexibility, sleep while lowering blood pressure & cholesterol, increasing circulation and improving your immunity. Yoga Studio is a one-hour yoga class designed to teach a series of poses to de-stress and clear your mind through relaxation techniques for the everyday person. 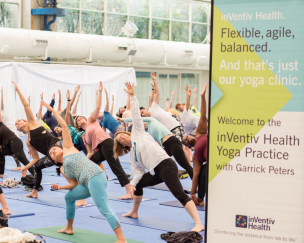 Attendees will be greeted at the entrance of the Yoga Studio by a brand ambassador, who will take their name, scan their badge and hand out sponsor literature. Sponsor’s banner will greet yoga guests; welcome and closing remarks are offered to the sponsor to ensure this event has a personal touch. During the event, a photographer will capture event images to ensure the sponsor receives a large publicity and social media bounce from their investment. After the class, guests will be offered healthy snacks and juices to start their day off right. A perfect service for guests to take pause and bask in this relaxing start to their morning. This has been priced separately below.